Allahabad University Scrutiny Form 2019: An applicant who not obtain the good marks in the University of Allahabad exam is required to not to worry. Latest Update: AU scrutiny form available here. Check the link provided in the table. The university provided them another chance to recheck their copies Allahabad University Revaluation Form 2019. Some of the applicant’s face regarding fill the revaluation form. So we are providing all the information regarding the University of Allahabad Revaluation Result 2019. Those candidates who don’t know the process of filling the Allahabad University Scrutiny BA Form is required not to worry. Go to the official site of the university i.e. On the opening of the official site applicant require to go on the student section. Under the student section, there is a category name as Download Form. Under the download form there is a link of scrutiny of Marks form. Click on the link, a pdf will open. The applicant requires taking print out of the form. After taking out of the revaluation form, the applicant has to fill the form within 2-3 days and submit in the university office. Students who want to apply for scrutiny (scrutiny) of B.Sc., B.Sc. and AU B.Ed. Part 1, 2, 3, Session 2019, will send their application with the prescribed fee from 02/ 07/ 2019 to 16/ 07/ 2019 up to the respective panels, submit them. Candidates, who have not got marks, can obtain an application for scrutiny by obtaining their marks from the university’s website. 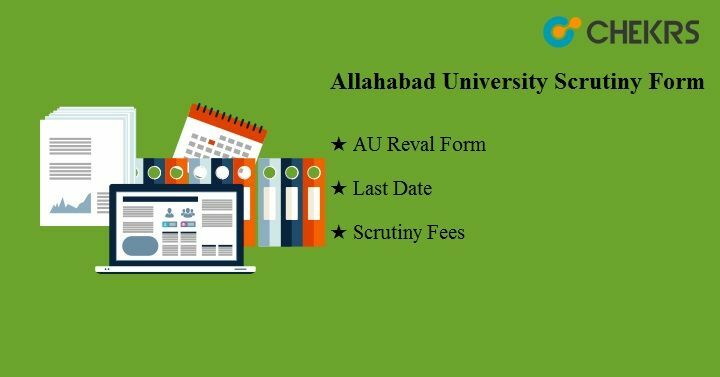 Those applicants who are filling the Allahabad university scrutiny form is required to submit the fee. The Allahabad University Revaluation Fees is Rs-100/- per subject. Candidate makes note that for each paper candidate have to apply the separate application form along with the photocopy of their mark sheet. The Allahabad University is established on 23rd September 1887, the university has always occupied an esteemed place among the University of India for over a century now. The credit for such large central college at Allahabad, eventually to develop into a university is due to Sir William Muir, then Lt. Governor of United Provinces. The information provided here is as per the official notification. The applicant can download the form from the link given above. If the applicant has further any queries they can contact us through the comment box.